* Wages slowed a bit in September, and now Atlanta Fed sees Q4 GDP at 2.6%. * With wages, GDP, and even inflation slowing, how can Fed hike? * Bolsonaro wins in Brazil. But the Bovespa may already have that priced in. * Q3 2018 Earnings are coming in strong, at $162 annual run-rate. * Therefore, our 2019 $165 Earnings Estimate looks low. We still like our 3,050 YE target! The Bureau of Economic Analysis reported that Personal Income increased for the 31stconsecutive month, up +$35.7 billion to a record high $17.726 trillion (SAAR) in September. This is an increase of +0.20% M/M; however, income slowed to +4.43% Y/Y (versus +4.73% Y/Y prior). Moreover, Disposable Personal Income (Income less Taxes) increased for the 34thconsecutive month, up +$29.2 billion (+0.19% M/M and +4.93% Y/Y vs. +5.25% prior). 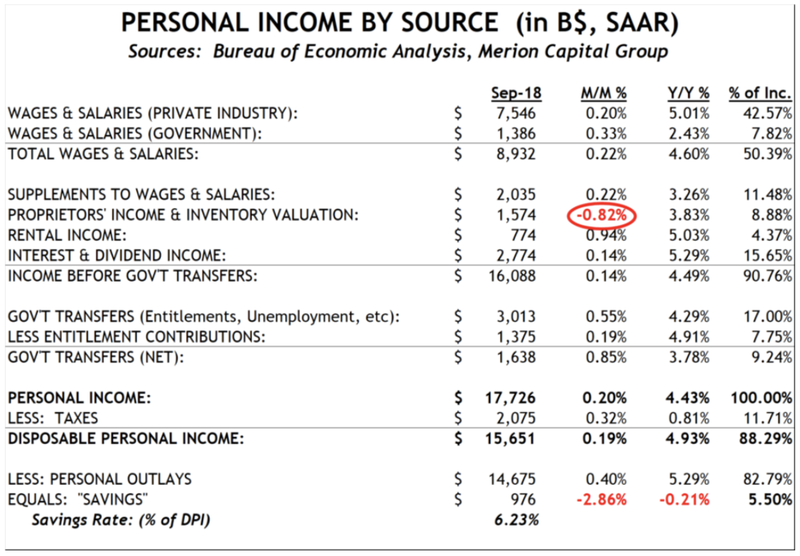 Note that Personal Income taxes increased +0.32% M/M and +0.81% Y/Y to $2.08 trillion (+0.97% Y/Y prior). 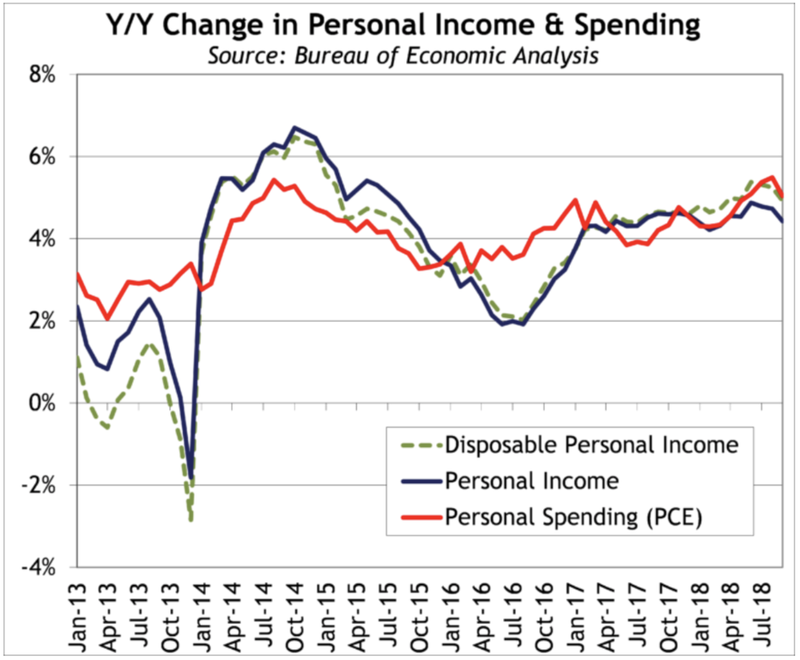 Personal Spending (PCE) increased for the seventh consecutive month, up +$53.0 billion to a record high $14.124 trillion in September. Thus, spending increased +0.38% M/M and +5.04% Y/Y (+5.49% Y/Y prior). In September, wages and salaries increased for the 31st consecutive month, up +0.22% M/M and +4.60% Y/Y (+4.79% Y/Y prior). Private wages increased +0.20% M/M but slowed to +5.01% Y/Y (+5.26% Y/Y prior) and Government wages increased +0.33% M/M and +2.29% Y/Y (+2.34% Y/Y prior). Note that Supplements to Wages & Salaries increased +0.22% M/M and +3.26% Y/Y (+3.34% prior). In September, Rental Income increased +0.94% M/M and +5.03% Y/Y (versus +4.93% prior) and Interest & Dividend Income increased +0.14% M/M and slowed to +5.29% Y/Y (versus +5.99% prior), despite the recent FOMC rate hikes. However, Proprietors’ Income declined -0.82% M/M and slowed to +3.83% Y/Y (+5.21% prior). Since Disposable Income lagged Personal Outlays in dollar terms in September, Personal Savings declined for the seventh consecutive month, down -$28.7 billion and the “Savings Rate” fell to 6.23% (versus 6.43% prior). As we’ve shown in prior notes, the “savings rate” is a plugged number and actually isn’t savings at all. It is defined as Income minus Spending minus Taxes. But “Income” isn’t exactly income, as it includes government transfer payments such as Medicare, Medicaid, Unemployment Benefits, and Social Security. When you factor in that individuals are receiving more in government benefits than they are paying into those programs, it becomes clear that savings isn’t actually savings; rather the government is running up the debt on our behalf. This debt is essentially an off-balance sheet item. When we add it back, we find that the true “savings rate” is actually -3.35% (far off from the +6.23% reported number)! The BEA also reported that the Fed’s preferred inflation metric (Core PCE Deflator) increased for the 18th consecutive month, up +0.015% M/M in September. Moreover, Core PCE increased +1.97% Y/Y (versus +1.96% Y/Y prior). Nonetheless, Core PCE is still within 3 basis points of the Fed’s target of 2%. Meanwhile, the headline PCE deflator increased +0.12% M/M but slowed to +1.99% Y/Y (+2.22% Y/Y previously), which is the slowest pace since February. 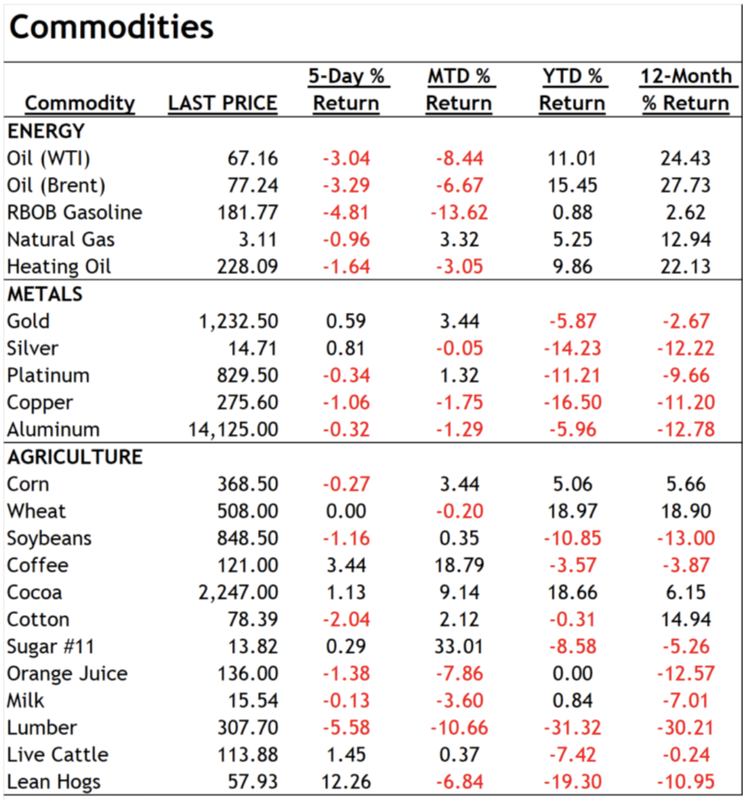 We have to ask the question, with commodities prices down, with CPI having peaked two months ago, with slowing GDP and with headline PCE ticking lower, how can the Fed hike at this point? Q3 S&P EARNINGS OFF TO RECORD START – TRENDING AT $162! As of October 26th, 238 of the S&P 500 Index companies have reported Q3 earnings, of which 184 have beaten earnings (77.31%) and only 36 have missed (15.13%) earnings estimates. 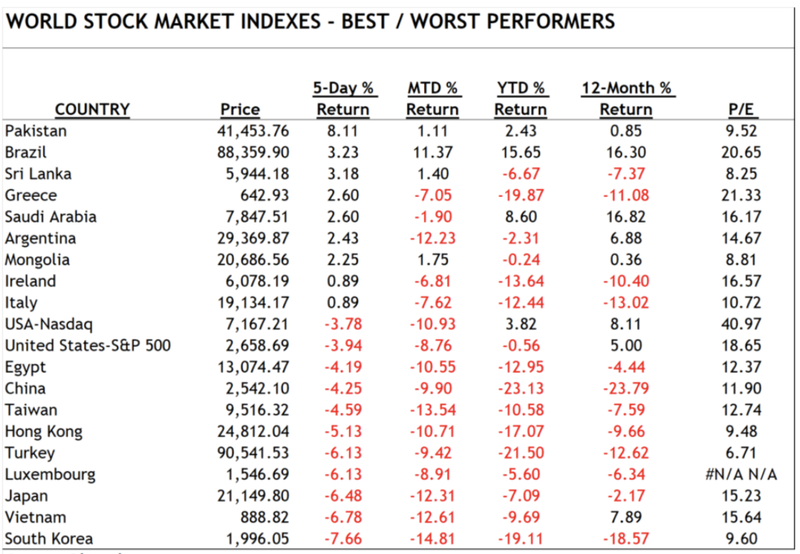 Moreover, 59% of companies have also beaten on the top line. Early on, the earnings beats have been led by Technology (96.43%) and Health Care (82.76%). On the other hand, only 50% of Energy companies and 55.6% of Materials companies have beaten Q3 estimates. It is now nearly half way through Q2 earnings season and all signs point to another record quarter. Due to the stellar numbers in Q3, over the few months Wall Street analysts have increased their 2018 Q3 EPS estimates by +$0.34/share to $40.52. At the current pace, Q3 earnings would be record earnings and up +29.3% Y/Y! Nonetheless, the street lowered their full year 2018 EPS estimates by -$0.41/share to $157.38 and their 2019 EPS estimates by -$0.64/share to $176.36. This implies EPS growth of +26.4% Y/Y and +12.1% Y/Y in 2018 and 2019, respectively. Although our outlook is still below those lofty forecasts, we still see strong EPS growth for 2018 and 2019. With margin pressures likely having peaked (wages slowed and commodities prices are falling), we think our 3050 year end S&P 500 target looks quite attainable still. Today, the Dallas Federal Reserve reported that the Current General Business Activity Index improved for the first time in four months, up +1.3 points to +29.4 in the month of October. This marks the 25th consecutive month of growth in the region. In the month, there were notable improvements in Current New Orders (+42 points to +18.9), Unfilled Orders (+4.1 points to +5.9), Delivery Time (+3.4 points to +7.5), and Number of Employees (+6.2 points to +23.9). Furthermore, there were increases in Prices for Raw Materials (+10.0 points to +54.4) and Prices Received for Finished Goods (+3.9 points to +17.5). However, there were slowdowns in Production, Shipments, Finished Inventories, and Average Workweek. As for the outlook, manufacturers had a slightly less positive business outlook, as the Forecast fell -2.4 points to +35.6. The Bovespa Index is up meaningfully today and closing in on its all-time high following the much anticipated presidential win by Jair Bolsonaro. Mr. Bolsonaro brings hope for economic reforms, including privatizations, reduced corruption, anti-crime, and even wants to start mining the rain forest to increase economic growth potential. From a macro perspective, we like the direct Mr. Bolsonaro is heading, but now comes the execution. There remain questions about Mr. Bolsonaro’s ability to enact pension reforms, and to turn a country around that faces tremendous debts, slowing GDP, and rising inflation. There are also questions about Mr. Bolsonaro’s military / autocratic leadership tendencies. It doesn’t help that Mr. Bolsonaro’s politician son, Eduardo Bolsonaro, threatened recently that they could shut down the Brazilian Supreme Court. Our take: With the Bovespa nearing an all-time high, we’ll take a wait and see approach to Bolsonaro. We tend to think this could be a ‘sell the news’ moment despite the potential for political and economic improvement. We want to see the execution of free market principals first, and a return to stronger growth, before we would want to jump in to Brazil. According to the Ministry of Economy, Trade and Industry, Japan’s Retail Sales declined for the first time in four months, down -0.19% M/M on a seasonally-adjusted basis in September (+0.88% prior). Moreover, retail sales slowed to +2.10% Y/Y (vs. +2.73% Y/Y previously). Retail sales slowed on a Y/Y basis because Total Commercial Sales slowed to +0.99% Y/Y (+4.16% Y/Y prior) and Wholesale Sales slowed to +0.51% Y/Y (+4.81% Y/Y prior). On the other hand, Large-Scale Retailers sales increased +1.12% Y/Y (versus +0.61% Y/Y prior). U.S. GDP: Our GDP model sees 3%+ Real GDP growth through Q1 2019, but as higher oil and interest rates flow through the system, our model sees slower growth thereafter (Note that the Atlanta Fed’s preliminary estimate for Q4 GDP came in at 2.6% today). Our model doesn’t factor in the stimulus from the recent tax cut, so the reversal in 2019 could be more pronounced than our model appreciates (it is presumed that 2018 will be better than our model due to the tax cut, whereas the delta for 2019 would be worse than our model predicts). U.S. Inflation: U.S. inflation appears to have hit a peak two months ago and with oil prices down and the dollar index up, we believe inflation has peaked (for now). U.S. Federal Reserve: The Fed is signaling that rates will be 100 bps higher by the end of 2019, and with inflation peaking, they’re wrong. We don’t even think they should hike in December at this point. 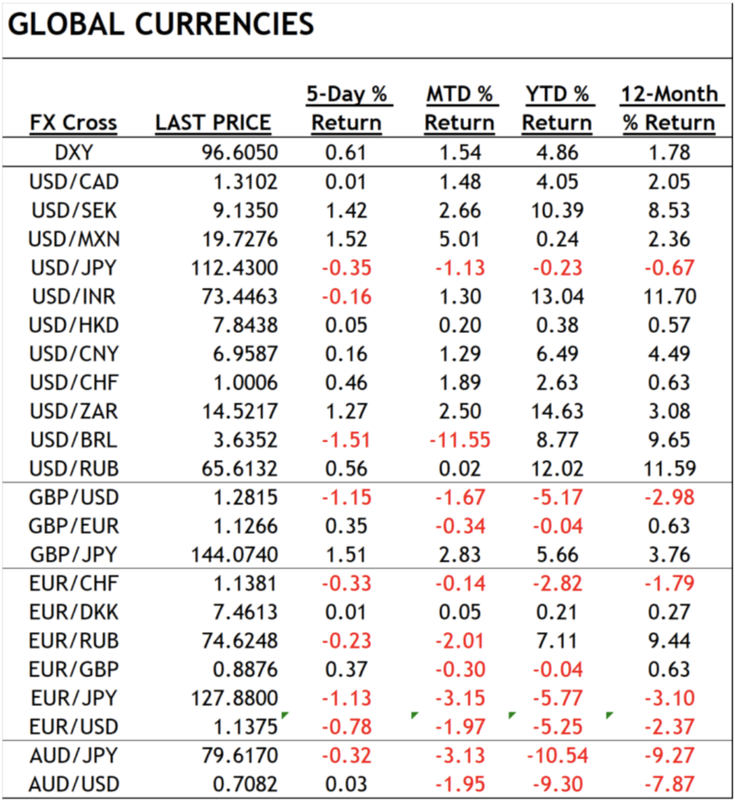 We believe the U.S. Dollar will continue to strengthen given interest rate parity and overall relative economic strength in the U.S., and this has now become a headwind for inflation (and potentially growth). We think a Fed pause is coming faster than the market currently appreciates (but a December hike is still on the table for now). U.S. Treasuries: Although recent inflation data has been cooling, the job market remains tight and Real GDP trending is still trending well above +3.0%. With that in mind, we still believe the yield on the 10-year U.S. Treasury will trend higher. We expect to see yields approach 3.50% by year end 2018, particularly if the market sniffs out a coming Fed pause (as that’s ultimately reflationary). U.S. Equities and Earnings: S&P 500 operating earnings are rising materially, but the question remains, will the market put a 20 P/E multiple on forward earnings? We think a 20 forward multiple is aggressive, but 18.5 may not be. Our SPX target is for an 18.5x P/E on 2019 forward earnings of $165, bringing our 2018 SPX target to 3,050. We prefer financials given expectations for economic growth and an improving (steepening) yield curve. We also have a positive bias on the Technology and Health Care sectors. Argentina: The macro looks abysmal in Argentina, and they have IMF involvement, but there is a silver lining here in that Q2 GDP was so bad that it might be hard for Q3 to be negative! Overall, Argentina’s economic condition appears to have weakened in 2018. Inflation is at a lofty 40.5%, Industrial Production is down -5.6% Y/Y, Consumer Confidence has deteriorated since January, the Economic Activity Index collapsed in May, and Unemployment jumped to 9.6% in Q2 (7.2% in Q4 2017). Canada: Canada’s housing market has been weak, as building starts and permits have gone negative, Retail Sales slipped in August, and home prices are slowing (Toronto area is now negative). Note that Canada’s monthly Real GDP has been in a slowing trend since October (3.5% in October, but now down to 2.4%), while monthly Nominal GDP has slowed from +6.5% in June 2017 to +4.1% Y/Y in Q2 … remember, nominal pays the bills. Mexico: Overall, Mexico’s macro data looks to be improving, but inflation is also turning up. GDP is up 2.6% Y/Y, Retail Sales accelerated to +4.2% Y/Y, PMI’s have been steady, and Consumer Confidence jumped in Q3. United Kingdom: If you look at the GBP, you’d think BREXIT is a major economic problem. 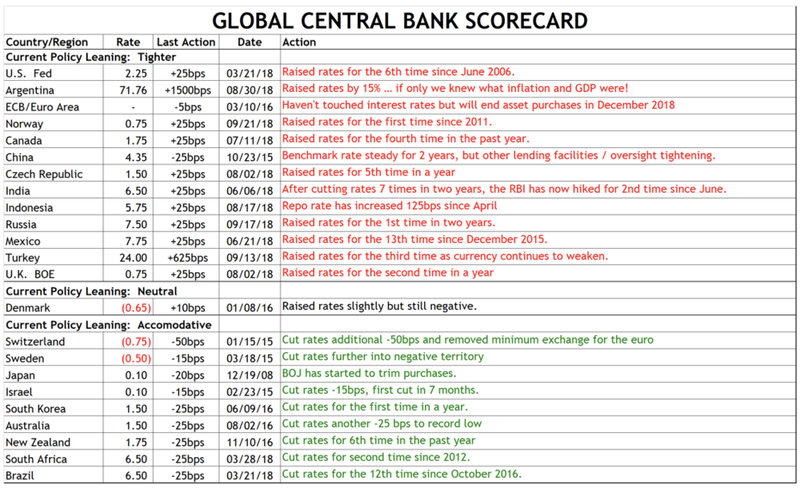 However, when you look at the macro data, you don’t see any meaningful deterioration. Inflation has been in a slowing trend in 2018, unemployment has been declining, wages have been turning up, and PMI’s have been steady. Even the big macro risk, housing, hasn’t shown much weakness. In fact, home prices improved slightly in August on a Y/Y basis. European Union: Although Unemployment continues to trend lower and Retail Sales are now up +1.8% Y/Y, Economic Sentiment is turning lower, Industrial Production is down -0.1% Y/Y, and PMI’s have turned back from recent highs, and the political situation has gotten so bad that Merkel isn’t going to run again. The events in Italy foreshadow possible macro risks for Europe, as monetary accommodation is removed. We still believe Europe is uninvestible. European Central Banks: The ECB is slowly removing accommodation and has reiterated its claim that bond buying is over in December. But Mario Draghi hasn’t given a timeline for raising rates and the recent decline in CPI will give them even further pause for doing so. Eastern Europe: As we saw earlier in the year with Italy, nations with high debt levels can rapidly become front-burner macro items. The same can be said for Eastern Europe, given high Debt/GDP levels, most notably Cyprus (104%), Croatia (88%, up from 66% at the end of 2013), and Slovenia (81%). Yet, economic data have been robust this year across most of Eastern Europe. South Africa: We remain highly negative on South Africa, but we have noticed recent efforts by the ANF to walk back some of the rhetoric. The ANF is now trying to reengage with foreign capital and wants to liberalize some of the rules around mining investment. Politics aside, the macro picture is getting bleaker by the day as Business Confidence is rolling over, GDP is negative, Inflation has turned up, Retail Sales are barely positive, and PMI’s are bouncing around the ‘50’ level. None of this will help unemployment (27.2% in Q2). In our view, the mere risk of having assets appropriated will grind foreign capital commitments and new business investment to a screeching halt, and more time is going to need to pass in order for foreign investors to feel any degree of confidence. Our best guess is that more downside exists for South Africa’s economy and we believe the currency and equity market will suffer as a result. Australia: The Australian data remain mixed but we have serious concerns about the decline in building approvals and new home loans. So far, the Unemployment Rate appears to be ticking lower (to +5.0% in September), Real GDP accelerated to +3.8% Y/Y in August, Exports are up +15.3% Y/Y, Wages are up +2.1% Y/Y, Retail Sales accelerated to +2.9% Y/Y in July, and Consumer Sentiment has ticked slightly higher recently. However, consumer credit remains elevated and the value and number of home loan approvals and permits have turned negative, which is a bad sign as home prices have turned negative as well. We remain neutral on Australia at this time but increased concerns about China could push us into the negative. China: It’s officially a trade war and Jack Ma thinks we’ve got 20 more years to go. We have the under on 20 years, but the over on 1 year as China isn’t even interested in meeting with the Trump Administration at this time (although there is a token Xi/Trump meeting on the calendar). China claims it’s going to pull out all the stops, is going to ‘encourage’ institutions to buy stocks, and there is talk of cutting taxes. We doubt any of this will work to plug the large liability problem in China’s banking system. We continue to believe that trade talks aren’t going to get better for quite some time and China will use every tool in its arsenal, which includes Renminbi depreciation. It is notable that China is already working to stimulate its banking sector by lowering reserve requirements and encouraging banks to do “debt for equity’ swaps. Note that PMI’s continue to indicate slow growth, Industrial Production is slowing, and now China may have an inflation problem. India: Indian economic activity appears strong, which runs counter to worries about shadow banking issues. Commercial Credit accelerated to +14.4% Y/Y in October, Industrial production has been strong, M3 money growth has been steady at 10%, and PMI’s still show growth (albeit slower). We are watching to see if any deterioration happens, but so far the only meaningful deterioration was confined to a drop in exports in September. Indonesia: Indonesia had gone four years without raising rates, but now rates have been hiked +125bps since Mid-April. Indonesia’s GDP and Private Consumption Expenditures are up over +5% Y/Y, Consumer Confidence has been stable, Manufacturing PMI had been stable in the 49-51 range for a year and came in at 51.9 in August, Industrial Production rebounded +9.0% Y/Y. However, Retail Sales slowed slightly to +2.8% Y/Y and Exports slowed to +4.1%. 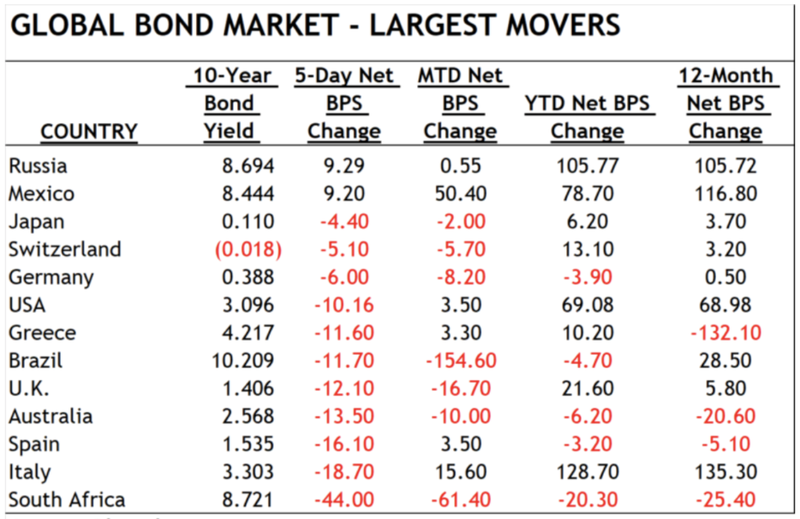 If there’s one emerging market that we’d be inclined to be bullish, this would be it, but we’d need to see the free-fall in the currency come to an end first. Japan: Overall, the economic data have been mixed but we are encouraged by Prime Minister Abe’s promise to fix social security, immigration, and workforce participation. We are slowly becoming positively biased. Russia: As we stated recently, the sanctions are beginning to have an impact on Russia. And it is never a good thing when officials talk about their ability to cushion “crashes”. We find Russia uninvestible at this time. South Korea: Overall, the economic data have been mixed. While the world looks forward to peace on the Korean Peninsula, we are keeping an eye on trade data into China, which increased +20.8% Y/Y in August. Also, GDP increased +2.8% Y/Y in Q2, Income is up +4.2% Y/Y, Industrial Production increased +0.9% Y/Y, and Retail Sales accelerated to +7.4% Y/Y. Conversely, the Unemployment Rate increased to 4.2% in August and the Nikkei South Korea Manufacturing PMI has been below ‘50’ for six months in a row.